Enjoy this hand crafted, 12.5CP Soup Tureen created by skilled artisans of Z.C. Boleslawiec, the original Polish Stoneware factory and brought to you by Pottery Avenue, the premier importer of only the finest Polish Stoneware with a mission to enrich and inspire your life through Polish Stoneware and ensure the 750 year old tradition continues to thrive. Surround yourself with beauty, function, and articles that embody the soul of each artisan and watch how everyday mundane tasks (like washing dishes) become enjoyable. Share our vision to move away from lifeless, mass produced items into an elevated lifestyle of Polish Stoneware. Any our Polish Stoneware tureens will provide years of enjoyment due to the artistic design and skillfully designed shape. You will also benefit from the, durable construction, and how chip resistant, and impervious to scratches it is as well has how well it retains heat and cleans up. These qualities combined with family gathers, good food, and joy will allow your Polish Stoneware to become a family heirloom and enjoyed for generations. Pottery Avenue proudly present this heirloom quality 12.5 Cup Stoneware Soup Tureen in the elegant EX UNIKAT design, BELLISSIMA. You will enjoy the quality hand crafted, tureen for slow cooking, baking and serving your favorite stews and soups with the excellent benefits of stoneware cooking. 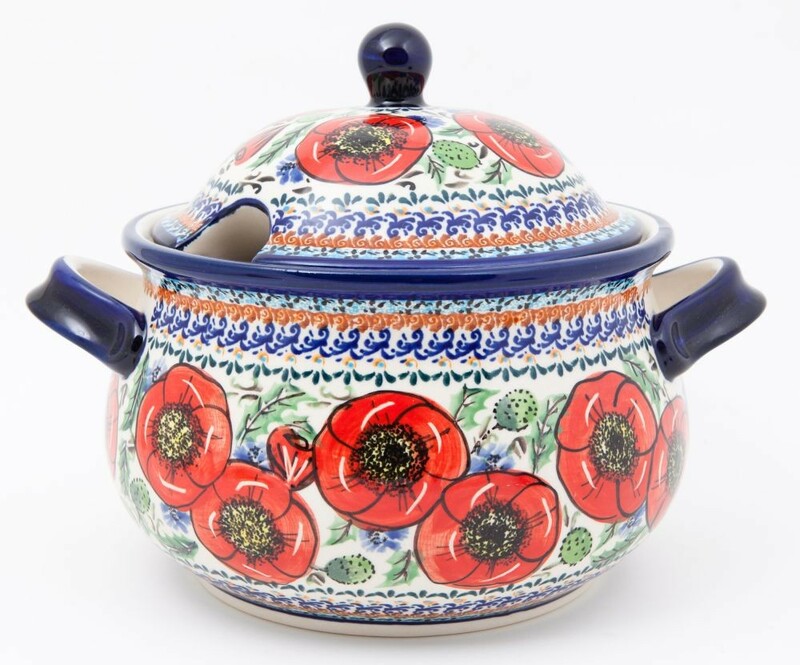 This 12.5 cup soup tureen was created by skilled artisans of Zaklady Ceramiczne Boleslawiec, the original Polish Stoneware factory known for having the top quality and exceeding the California Prop 65 test for food safety. BELLISSIMA is from the EX UNIKAT design group and is “hand stamped” and hand painted by the most elite Master Artisans of Boleslawiec. Using and gifting Polish Stoneware from Pottery Avenue is a treasure and elevates daily tasks to a more artisan inspired approach making even the most mundane tasks more interesting and bringing you to the present moment. You will also benefit from the famous “white firing” clay that creates a durable construction, and chip resistant qualities. The patented formula glaze is naturally nonstick and impervious to scratches. These qualities combined with family celebrations, good food, and joy will allow your Polish Stoneware to become a family heirloom and enjoyed for generations. The eye-pleasing appearance of this Polish stoneware makes it a wonderful addition to your cutlery collection as it promises an intriguing blend of form, function and timeless elegance. The EX UNIKAT pattern of this stoneware exemplifies the brilliance of Polish artisans to create an impressive design. The elaborate depiction of floral accents in dark orange is nicely complemented by green leaves to create a realistic scene of a garden, while hints of indigo blue add beauty to the flowers. The border gracing the edges features multiple layers that exhibit classic Polish designs and the rick strokes as well as the use of colors make this work of art a treasured possession. • Constructed with the famous white clay, indigenous to the region of Boleslawiec Poland. • Non-porous surface which is completely sanitary and will not retain odors or stain and the non-stick properties make clean up easy. • Certified dishwasher, microwave and oven safe to temperatures of 480 degrees. • In addition to the function, the attractive design will fuel your inspiration and creativity in the kitchen and enliven your table. • Sculpted by expert craftsmen who add subtleties in the form to enrich the function and look. • Decorated with the traditional hand stamp technique and brush work unique to the Polish Stoneware tradition. • Featured in our “Flowering Peacock” collection, this modern pattern is based off the 300 year old classic pattern, “Eye of the Peacock Feather”. This beautiful pattern is decorated in a rich cobalt blue, white polka dots with green and brown with a ribbon of dime size blue flowers with chestnut brown centers. This artistic strategy has allowed the author to achieve the effect of timelessness and elegance of design which is crucial for tableware pottery. * “Flowering Peacock” is a classic pattern, with modern elements that fit comfortably into any home style or table setting. The EX UNIKAT patterns from Zaklady Ceramiczne BOLESLAWIEC exemplify the brilliance of Polish artistry and proves the depth of creativity that can only evolve over centuries. Blending the Polish traditional hand stamp technique with paint brushes transforms the once folk or classic look of Polish Pottery into modern day designs that will maintain the timeless beauty these artisans are known for creating. BELLISSIMA depicts the beloved Poppy flower in rich Venetian red, celery & olive green leaves and kisses of ocean blue corn flowers all framed in a garland of elaborate floral accents in citrus orange, cobalt blue, chestnut brown and sky blue. In the background, complementing multi colored green leaves throughout create a realistic scene in a garden, while hints of yellow and black accent the poppy centers adding beauty to the overall design. BELLISSIMA is a limited edition pattern due to the labor intensity of EX UNIKAT designs and only a small group of Master Artisans are certified to paint EX UNIKAT patterns. This skill level, in the Master Artisans profession, is equivalent to producing museum quality productions to view behind glass. Pottery Avenue joyfully brings BELLISSIMA to expand your Polish Pottery Stoneware collection knowing it will enrich and inspire your day to day routines and turn your home into a work of art, that you can use! Try a delicious, bountiful Creamy Spicy Sausage & Cabbage Soup and fill your home with the aroma of comfort as the flavors blend. Cabbage is not only healthy but also buttery delish after it is cooked. It takes on added flavors and offers a nice texture to the dish. Fall offers a plentiful array of veggies and your local meat market will have the perfect, robust sausage for your family’s taste buds. Sautee your veggies to release natures flavors and combine with cooked sausage. The sausage can be cut or removed from the casing by squeezing it free and breaking apart as it cooks. After combining your ingredients, add adequate amounts of stock and bake for 30 minutes in the tureen. Take a moment to add a little designer touch with a dollop of sour cream and a sprig of fresh green herbs such as dill.